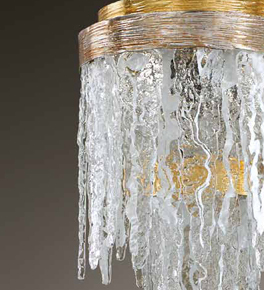 This collection is realised in expertly hand worked glass that mimics the appearance of stalactites. The glass is created to give an ice effect that contrasts beautifully with the warmth of the frame. This collection includes chandeliers, flush fitting ceiling lights, pendants and wall lights. Stalattite is Italian for Stalactite.